Pebeo Porcelaine 150 Paints can be applied to almost any heat-stable surface, including porcelain, crockery, terra-cotta, metal, ceramic, and glass. Allow painted items to dry for 24 hours, then bake them in your home oven at 300°F for 35 minutes for a finish that's as permanent as fired enamel. With a range of more than 50 lightfast colors, these professional waterbased paints blend beautifully with one another and thin with water or medium. Once fired, Porcelaine 150 colors are safe for common detergents and solvents, the dishwasher (top rack), and outdoor use. The paints are non-toxic but not recommended for use on surfaces that come in contact with food. Porcelaine 150 colors are not intermixable with Pebeo Vitrea 160, and they heat set at different temperatures. Whereas Porcelaine 150 colors are solid, Vitrea 160 colors achieve more of a fused glass or blown glass look. Pebeo recommends that you use a soft, natural fiber brush, such as a squirrel hair quill or a red sable watercolor brush, to apply Porcelaine 150. A soft brush will have the right consistency for the paint, and is less likely to leave brush marks. Individual colors and mediums are packaged in 1.5 oz (45 ml) bottles. Porcelaine 150 outliners are packaged in 0.68 oz (20 ml) squeeze tubes. Many of the transparent and semi-transparent colors, as shown in the color charts, appear quite dark. Names of colors often reflect the special qualities that colors take on when light passes through. Mediums — Matte and Gloss mediums modify the appearance of the finished surface. Outliners — Available in selected colors, Porcelaine 150 outliners have a thicker consistency, creating a raised surface. They are packaged in 0.68 oz (20 ml) squeeze tubes. Chalkboard Black — Pebeo Porcelaine 150 Chalkboard Black paint allows you to design and create a real chalkboard on any slick, non-porous item, including china, porcelain, ceramic, metal, and more. Simply apply the paint to the surface of the piece, allow it to dry for 24 hours, and bake it in a conventional oven for 30 minutes at 300°F. Chalkboard Black dries to a hard, flat, black matte finish that may be written on with chalk. When the message has been "delivered" to your satisfaction, simply erase the old message and write a new one! Chalkboard Black paint is great for decorating coffee mugs, or even dinner plates. Not only does your artwork provide daily fun at mealtimes, Pebeo Chalkboard Paint is permanent, microwave oven-safe, and dishwasher-resistant after baking. 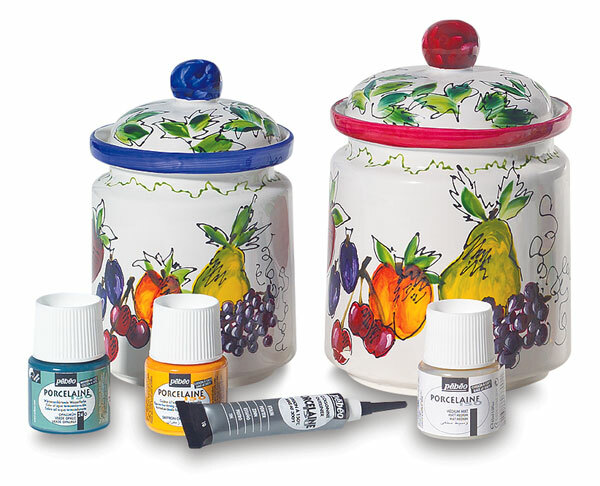 Porcelaine 150 Workbox Set — This innovative set comes in a plastic carrying case that opens into a fully functioning double-layer workbox full of deep, opaque colors that can be easily mixed and baked to create a dishwasher-safe enameled finish. The set contains 10 of the most popular Porcelaine 150 colors in 1.5 oz (45 ml) bottles, as well as a Squirrel hair paintbrush, a mini-palette, a 20 ml tube of Gold Relief outliner, a sponge, and a user guide. Colors included are Marseilles Yellow, Agate Orange, Lapis Blue, Ruby Red, Amethyst Purple, Turquoise Blue, Peridot Green, Mummy Brown, Green Gold, and Dune Yellow. 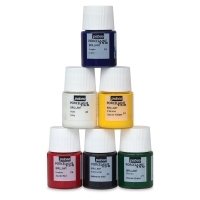 Discovery Set of 6 — A great introduction to Porcelaine 150 Paint. This set includes Anthracite Black, Citrine Yellow, Ivory, Lapis Blue, Olivine Green, and Scarlet Red in 0.68 oz (20 ml) bottles. Undercoat White — Porcelaine 150 Undercoat improves adhesion on porous surfaces. 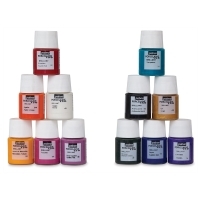 Discovery Set of 12 — This assortment of 12 popular colors in 0.68 oz (20 ml) bottles is enough paint for a few different projects. Set includes Agate Orange, Anthracite Black, Bronze Green, Fuchsia, Gold, Ivory, Marseilles Yellow, Opaline Pink, Parma Violet, Sapphire Blue, Scarlet Red, and Turquoise. Porcelaine 150, Set of 10 — This set includes 1.5 oz (45 ml) bottles of Anthracite Black, Esterel Brown, Gold, Ivory, Lapis Blue, Marseille Yellow, Olivine Green, Peridot Green, Sapphire Blue, and Scarlet Red. Once baked, Porcelaine 150 paints are permanent and dishwasher safe. To heat set a finished piece, wait for the paint to dry completely. Place it in a 300°F (149°C) oven for 35 minutes. Since many vitreous and ceramic materials cannot withstand sudden changes in temperature, we recommend that you place your piece in a room temperature oven and allow it to warm up with the oven. After 35 minutes, turn the oven off and allow it to cool back to room temperature gradually. Porcelaine 150 is not recommended for use on surfaces that come in contact with food. Achieve the look of true glazed ceramics without the expense and difficulty of working with a kiln or kiln fired paints. These beautiful and colorful paints become permanent after baking in a home oven. See a demonstration of these paints applied to a tile.